Those long-lived NASA Mars rovers--Spirit and Opportunity--remain in fairly good shape, with one robot in survival mode as martian winter arrives while its twin snakes its way across a taxing terrain of sand dunes to reach a striking target. "Both rovers are doing really well right now," said Steve Squyres of Cornell University, lead scientist for the Mars Rover Exploration project. "We had a bit of a scare with Spirit awhile back, losing use of the right front wheel less than a hundred meters shy of our intended wintering spot on McCool Hill," he told SPACE.com. Squyres said the wheel breakdown came at a time when the terrain was treacherous, a site of soft sand and salt deposits. "That kind of stuff is hard enough to drive in with six wheels, and with five it was just about impossible. It was really frustrating, being that close to the place we wanted to get to ... and not being able to reach it." Thanks to the tenacity of rover drivers back on Earth, Spirit was unstuck, then backtracked onto more solid ground--dragging its no longer working wheel. An alternate winter-over spot for the rover was picked on "Low Ridge"--named after George Low, the late NASA Deputy Administrator who played a key role in the Apollo lunar landing effort. "Low Ridge is actually a beautiful spot ... one of the most scenic places we've been at Gusev. And there's lots of good science nearby," Squyres said. Within just a few meters of the Spirit rover, there is finely layered bedrock, blocks of vesicular basalt, and what appears to be very salt-rich soil. "So, there's enough to keep us busy here for quite a long time," Squyres said. The solar-powered Spirit is in Mars' southern hemisphere, where the Sun is crossing lower in the northern sky each day. Thus, the amount of energy available will keep dropping until the shortest days of the Mars winter end, four months from now. To keep producing enough electricity to run overnight heaters that protect vital electronics, Spirit's solar panels must be tilted toward the winter sun by driving the rover onto north-facing slopes. What's in store for the Mars machine is spending time at the location doing in-depth science. Since Spirit drove away from the summit of Husband Hill, the rover has been blasting along at high speed, stopping for science only briefly, Squyres said. "The reason, of course, is that we had to get all the way across the Inner Basin and over to this area for north-facing slopes before winter hit." Now that this has been accomplished--and Spirit is now safe--Squyres said that rover scientists finally have the chance to stop and really do some science in detail. "So expect to see a very big panorama from this spot," Squyres noted, along with use of the rover's Miniature Thermal Emission Spectrometer (Mini-TES). This instrument provides remote measurements of mineralogy and thermophysical properties of the landscape around the rover. In addition, he said, a very comprehensive set of measurements will be done with every tool available on the robot's mechanical arm. "We're likely to do some small rover moves, but not any long ones until spring comes. By the time winter is over, Low Ridge should be the best studied place on Mars," Squyres advised. Meanwhile, on the other side of Mars, the Opportunity rover is wheeling its way to a major goal: Victoria Crater. But it is a tough, long slog. "It is full speed ahead to the south," Squyres reported. The power situation for Opportunity is much better than it is for Spirit, largely because this rover at Meridiani Planum is much closer to the equator. The robot can be driven an hour and a half or two hours each day, he said. The terrain Opportunity faces consists of large sand ripples and patches of flat-lying rock outcrops. Whenever possible, rover planners keep Opportunity on the "pavement" for best mobility. "We're also really getting the hang of driving in this terrain," Squyres added. 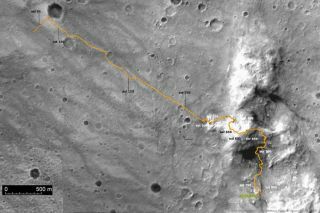 At present, Opportunity is less than 5,000 feet (1.5 kilometers) from the rim of Victoria Crater, and making good progress daily. This feature is an enormous depression, measuring a half-mile (800 meters) in diameter. "There's still no telling whether we'll make it or not, of course ... we're so far past warranty that the rover could give out at any time. But at the moment things are looking good," Squyres pointed out. "We will make occasional brief stops for science, but for the next several months we expect mostly to just keep pushing south." Squyres said that Opportunity team members have been naming all the rocks seen lately after landmarks along old western cattle drives. Doing so is "keeping with our 'keep'er rolling' mentality," he concluded. Spirit and Opportunity have been exploring Mars since they independently landed on the red planet in January 2004.